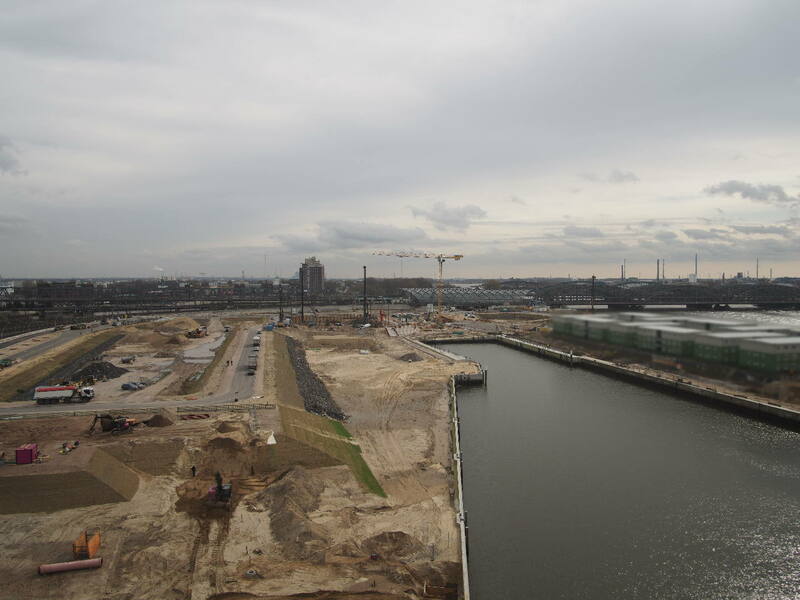 A highly attractive urban green space is taking shape in the quarter of Am Lohsepark, at the heart of HafenCity. The quarter holds special significance for the entire HafenCity and neighboring districts, not only due to the park completed in July 2016 with the Hanover railway station memorial, which serves as a powerful reminder of Hamburg’s history of deportation, but also because of the school campus that is being built. The starting point for development was, to a certain extent, the listed and outstandingly renovated Hildebrandtblock brick ensemble between Lohseplatz and Shanghaiallee, now the headquarters of the privately owned Prototyp automobile museum (69a). Generally speaking, the development plans for the quarter revolve around closed block structures with five to seven stories grouped around Lohsepark. In the northeast, the future site of Gruner + Jahr, the structures will be even taller. The direct connection to the north via Brooktorhafen is secured by the Ericus Bridge, which was renovated in June 2014. The original structure, a revolving railway bridge, was built in 1870. Hamburg-based petroleum company Marquard & Bahls moved its new company headquarters (65) to a new location between Brooktorhafen and Koreastrasse in 2016. The main customs office of Hamburg-Stadt and the customs office HafenCity, located on the customs property (66) to the south, will continue to provide their services in the future. The ground floor of the adjacent office building (68/69), which is designed to serve as a visual parallel to the historical memorial site, will be occupied by the documentation center, which is part of the Hanover railway station memorial (denk.mal). A bit further south, directly adjacent to Lohsepark, an urban mixed-use plot (70–72) consisting of almost 500 rental, social, joint, and privately owned apartments, student residences, social amenities, three daycare centers, and a hotel, were completed in late 2018. Since 2015, this has been the home of HafenCity’s first inclusive housing community, inhabited by young people with disabilities and students. On the ground floor of Shanghaiallee, northern Germany’s only three-star chef Kevin Fehling runs the exquisite restaurant ‘The Table.’ On the opposite, eastern side of the park, the Gruner + Jahr publishing house will be adding three contiguous plots (74-76) starting in 2019. A new building will be constructed for the approximately 2,000 employees of the publishing house as well as additional office and exhibition space. Apartments will be added on the southern part of the site, half of which are to be publicly subsidized. To the south, on the southern side of the Hanover railway station memorial, some subsidized apartments (77a) as well as space for services, sports, and foodservices are being built. On the adjacent plot, the HafenCity school campus (77b) is expected to house a grammar school and a district school under one roof, which will likely make it the largest public school in Hamburg starting in 2022-23. The easternmost property of the quarter has already been allocated: The ‘Hotel of the Future’ (78) will bring yet another innovative hotel concept to HafenCity. It will be rounded off by exhibition spaces and co-working spaces on the ground floor. However, it is estimated that construction cannot begin until 2021, as a tunnel under the railway line which will cross under the future building must be built first.